Steampunk is a great genre that can spin most any classic into something new. The fact that the very earliest Steampunk happens to be classic Jules Verne, back before anyone had an inkling as to what might come from those humble beginnings, just makes it that much more interesting. I’ve seen several adaptations of popular stories, and some have worked out better than others. Red Sonja is a great character. She’s had her ups and downs, her share of controversy, and has gone through multiple evolutions. At her best, Sonja is the penultimate feminist and simultaneously a fully functioning “female chauvinist”. At her worst, she’s a two dimensional stereotype running around in a chain mail bikini. 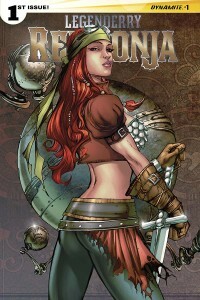 It’s early in the story, but so far I might have to say that this version of Sonja is falling somewhere in the middle. I will say that with four more issues in this limited run, there’s a lot of room for growth, and some great potential. We’ve got Sonja jumping into the middle of a kidnapping plot. Nothing new there… in most of her adaptations, she’s shown a pretty serious impulse control problem. We’ve also got another literary character slipping into the mix as Sonja finds herself battling a group of brutes who appear to have been cobbled together out of spare body parts, and are pretty tough to take down. I’ll come back to this in an issue or two and see how Sonja’s doing. Hopefully she gets a head of steam (ha, see what I did there? ), and the problems I had with this issue prove to be a slow start for an introduction.